In a recent project led by M-Brain, leading industry IT Executives shared their best practices implementing machine learning (ML) projects at their organizations. 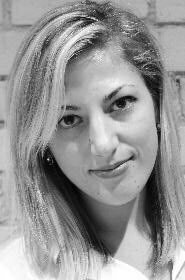 executing strategic analysis and advisory projects. 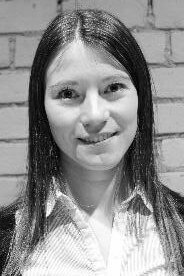 executes strategic analysis and advisory projects. Machine learning is a practice which is growing exponentially within North American and Global organizations. Organizations across a number of industries, including Healthcare, Financial Services, Manufacturing, and Retail have been inspired to undertake such initiatives due to various business needs, predominantly improving predictive analytics capabilities and automation. Despite the differences that exist in use cases and business needs across not only different industries, but also between organizations within specific industries, there is one key takeaway shared by all – the implementation of machine learning into organizations has proven to have a direct (positive) impact on earnings and profits. In addition, machine learning accomplishes thousands of industry and company-specific goals, such as automating services, modeling pricing and services, improving customer service and predictive aspects such as fraud, threats, and even temperature control in manufacturing facilities. 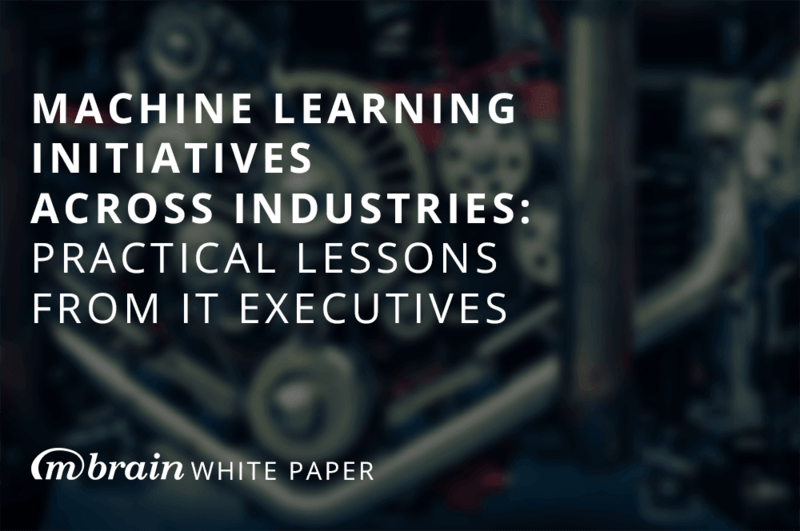 IT executives, who are the key stakeholders involved in machine learning initiatives, have shared a number of lessons learned and best practices. The insights gathered in this project show that with a visionary, forward-thinking leadership team and trustworthy, knowledgeable partner, there is no limit to the potential of machine learning in any business or industry setting. Recent M-Brain research included in-depth interviews with IT management of twenty large companies (1000+ employees) across verticals including financial services, manufacturing, healthcare, retail, and media & gaming (see Exhibit 1). CIOs, CTOs, VPs of IT and IT Directors from the interviewed organizations shared their experiences related to the tactical implementation of machine learning initiatives. This article outlines a summary of key findings from this research, including key lessons learned, examples of use cases, business needs that have lead to the initiation of machine learning projects, involvement of different stakeholder groups, insights on outsourcing preferences and external vendors of technology and human work, key steps of typical machine learning projects, as well as the evaluation of key benefits. CIOs and IT decision makers shared an extensive list of best practices that they would recommend to the organizations planning to implement machine learning projects. There is a wide variety of application areas for machine learning technology. 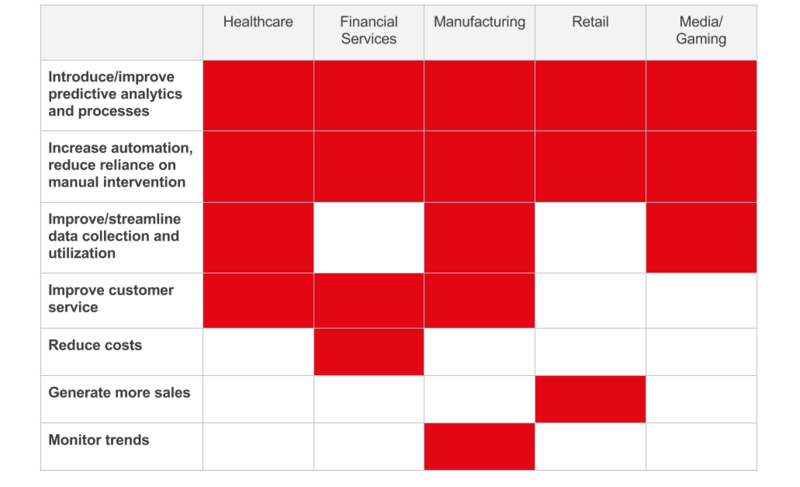 During interviews, use cases varied not only between the analyzed verticals, but also within each vertical (as illustrated by Exhibit 2). Examples of the discussed application areas included data analysis to support cancer and asthma treatments in healthcare, increased accuracy of insurance rate modeling in financial services, control of humidity and temperature in manufacturing facilities, prediction of future product demand to support inventory planning in retail, as well as recommendation engines in media & gaming. Identified business needs that inspired machine learning projects varied significantly between the analyzed companies (see Exhibit 3). However, some common themes were discovered as well. 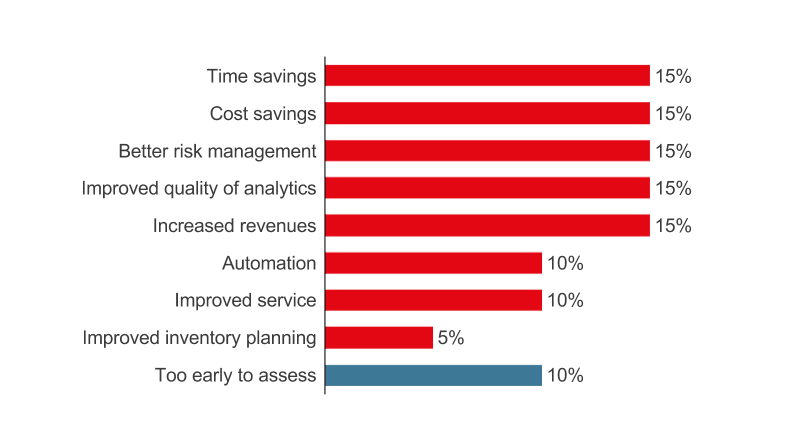 Improving predictive analytics and processes and increasing automation were identified as key needs across all industries, as shown in Exhibit 4. Other common themes included the need for better data utilization, and improved customer service. 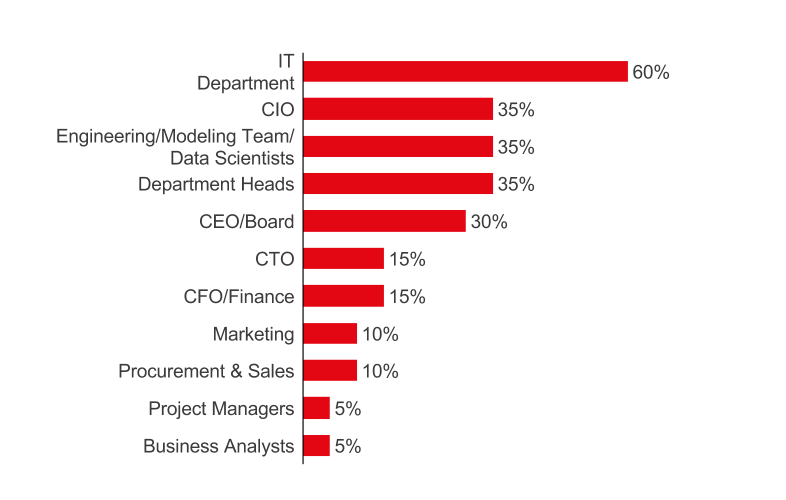 The IT department is the most involved in machine learning projects, based on the insights received from the respondents. Note 2: Department Heads refers to leaders within key departments involved in ML initiatives; This differs by industry – examples include Strategy, Cardiology, Wealth Manager, Design Director, etc. 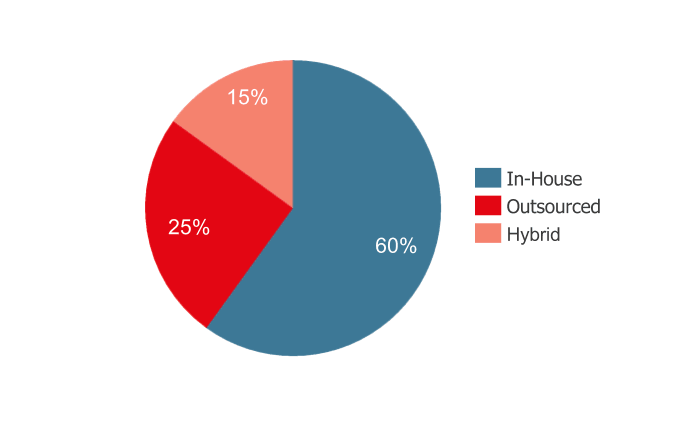 65% of respondents outsourced at least part of human work in machine learning projects to external vendors, as shown in Exhibit 6. 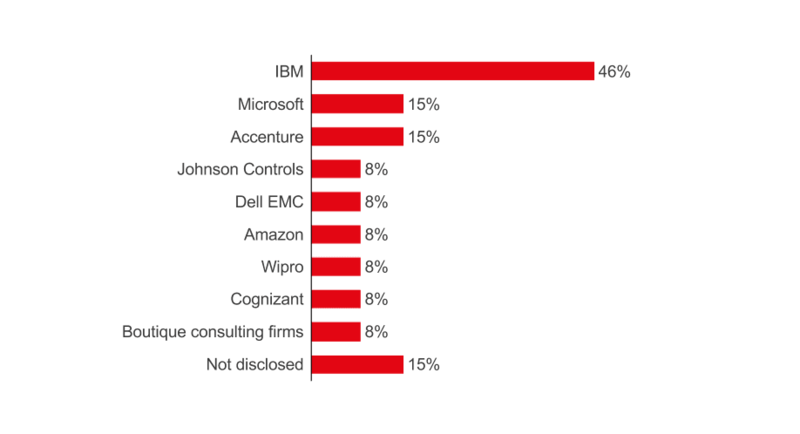 46% of respondents that outsourced at least part of the human work or hire external vendors for consulting selected IBM as their vendor (see Exhibit 7), followed by Microsoft (15%) and Accenture (15%). Companies that kept all work in-house argue that this decision helped them to keep all the knowledge gained during the project in-house. 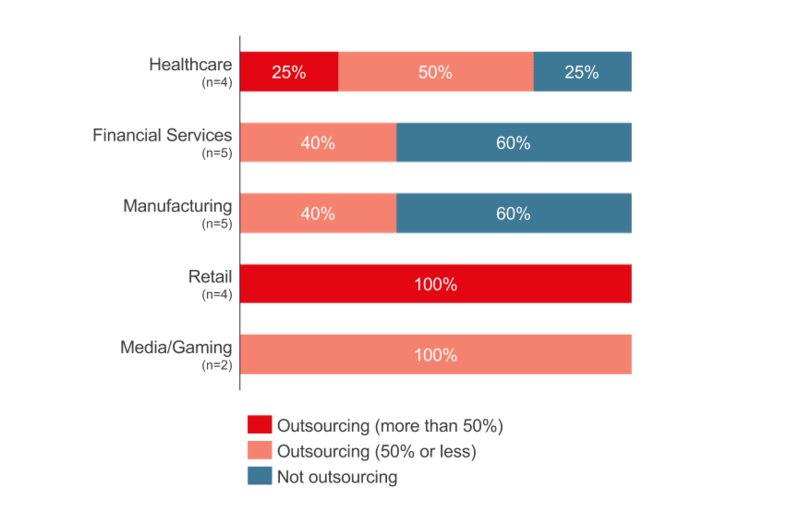 As illustrated in Exhibit 8, financial services and manufacturing companies were more likely to keep the human work in machine learning projects in-house, compared to other verticals. All retail industry respondents used external vendors for more that 50% of the work. With regards to the software and tools used for machine learning, 100% of respondents across all analyzed verticals said that they were using external software and tools in their machine learning projects. 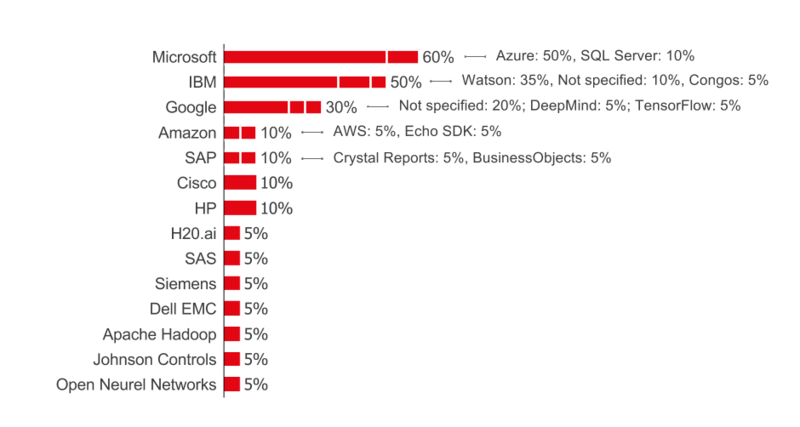 Microsoft (60%) and IBM (50%) were the most frequently selected vendors of machine learning software, followed by Google (30%). The specific names of the software used are listed in Exhibit 9. 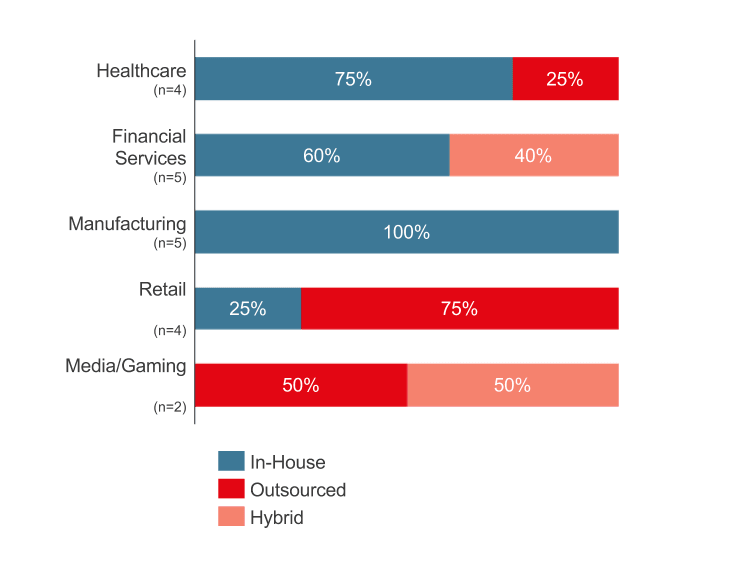 60% of the interviewed companies relied on in-house data scientists for machine learning projects, 25% decided to outsource all data science work, and 15% used a hybrid model. Manufacturing was the only industry vertical that relied completely on their internal in-house data scientists (see exhibits 10 and 11). Companies that decided to keep the data science work in-house justified their decision by the fact that they already had sufficient in-house data scientist resources. 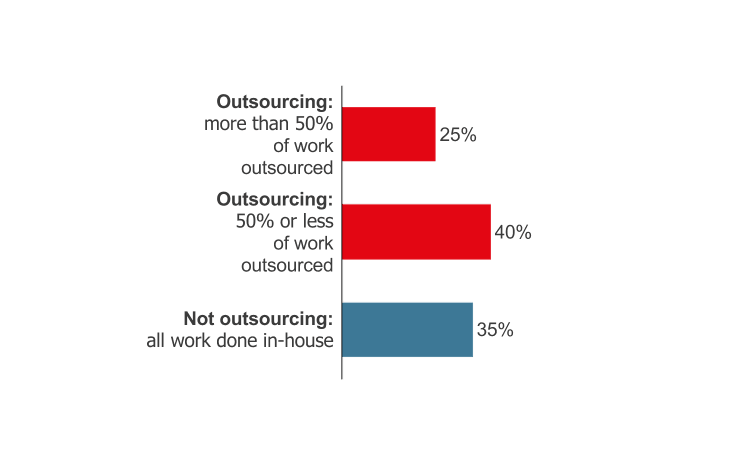 Some of them may still decide to outsource for short-turnaround projects where more resources are required. When necessary, employees underwent special training to learn the required skills. Note 1: Software is not included in this analysis; see next page for an overview of external tools used. Key steps in a typical machine learning project included the identification of the need and key stakeholders, building a business case around expected benefits, planning the project and clarification of key objectives, evaluation or vendor offerings, ending with approval and implementation. As illustrated in Exhibit 12, the key difference between verticals in the typical steps of a machine learning project is the timing of vendor evaluation. The insights show that healthcare companies were more likely to select vendors at a later stage of the project, as compared to other verticals.M-Brain research shows that the implementation of machine learning projects takes anywhere between 3 and 26 months (11 months on average). Most respondents who commented on this topic said that the pre-work phase took them up to 3 months, with 4 months being an average for the whole sample of responses. Please refer to Exhibits 13 and 14 for details. 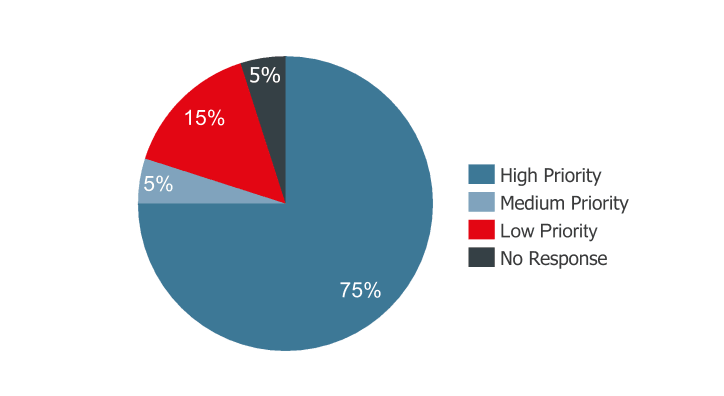 Respondents felt that the most difficult step in machine learning projects was data collection and processing (25%), as well as finding the right vendor (20%), as shown in Exhibits 15 and 16. Healthcare and financial services companies were also concerned with compliance and regulatory requirements. A quarter (25%) of the interviewed companies said that seeing the results and the final launch was the most successful and rewarding step in their project. Other successful steps mentioned included the initial project phases, data collection, and overall team collaboration during the project (see Exhibits 18 and 19). 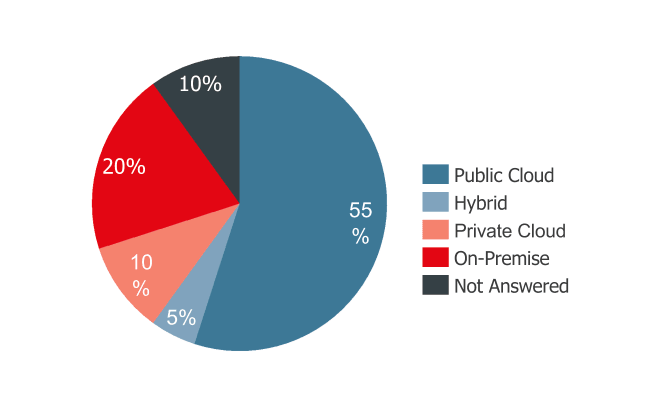 The majority of interviewed respondents (55%) stored the data for the discussed projects in the public cloud. Several respondents already had data in the cloud before the project started. 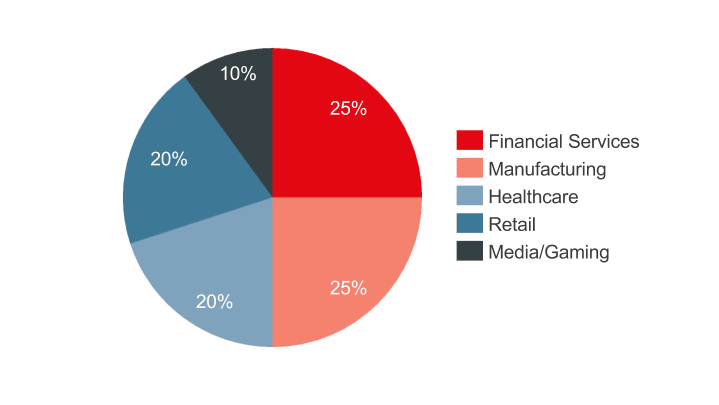 20% chose to store their data on-premises, with majority of these companies being in financial services sector, as illustrated in Exhibits 19 and 20. All interviewed respondents said they have found their machine learning project initiatives successful. Many of the identified benefits of machine learning initiatives have direct impact on earnings and profits (see Exhibits 21 and 22). Key benefits included time and cost savings, increased revenues, better risk management, and improved quality of analytics. Are you looking for answers to specific research questions that will help you become more competitive? Call us at M-Brain. We can help. Thank you for your interest in M-Brain content! Please fill in the form and download the White paper or e-book. You will be able to download any M-Brain White paper or e-book on a complimentary basis for three days. M-Brain is committed to ensuring that your privacy is protected. The information you provide will be used only for our internal records and to improve our products and services. We may periodically send promotional emails about new products or other information which we think you may find interesting using the email address which you have provided. Thank you. The information you provide in this form will be held securely by us and deleted when no longer needed. We may use it to contact you now or in the future. It may be transferred to other organisations within M-Brain Group, including those outside EU.